This full experience of September 11th sites in Manhattan includes a 1.5-hour guided walking tour of Ground Zero and the 9/11 Memorial, plus entry to the 9/11 Museum and the One World Observatory. As you're led by a local New Yorker guide with personal connection to the events of 9/11, hear stories of tragedy and heroism and gain a deeper understanding of the attack and aftermath. In remembrance of September 11, 2001 this walking tour takes you through the former World Trade Center in New York City, where the events of 9/11 took place. You'll be guided by New Yorkers who have connections to the event, listening to their personal stories and touching accounts of the heroism of many others. Your tour starts at St. Paul's Chapel, the oldest public building in NYC still in continuous use, which miraculously survived the falling debris from the 9/11 attacks despite being one block away. It became a makeshift rescue center during the aftermath, and its iron fence became a bulletin board where family members posted notices of missing loved ones. Today, the church's collection of mementos received from people around the world continue to serve as a tribute to the people of New York. Continue to the Firefighter's 9/11 Memorial Wall, where you'll hear the heroic stories of the emergency responders, and see the Engine and Ladder Company 10/10, the fire station at Ground Zero. 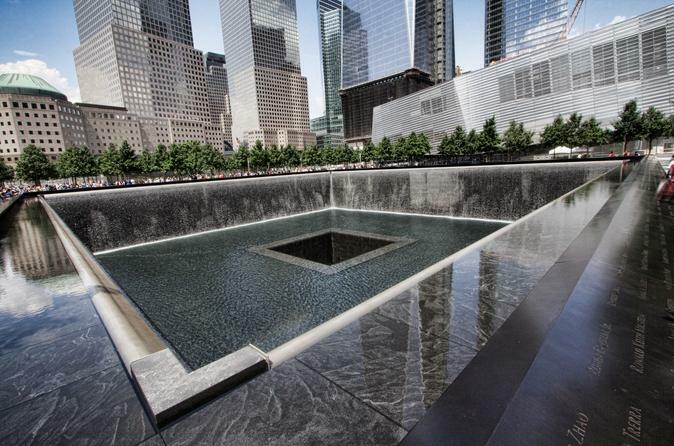 Enter the 9/11 Memorial, where you can pay your respects to those who lost their lives in the World Trade Center. See the Reflecting Absence Memorial, the manmade waterfall inside the memorial, symbolizing the vast void left by the tragedy. Read the names of the nearly 3,000 victims placed around the waterfall next to their friends, family members, and colleagues, made all the more poignant thanks to the new One World Trade Center building that now rises behind the memorial. At the conclusion of your tour, your guide provides you with a timed entry ticket to minimize your wait time at the museum, which you'll enter first, followed by the observatory. Your guide gives you a preview of the museum and what to expect so you can optimize your time spent inside. Your visit is self-guided, so you'll explore at your own pace, checking out artifacts from the attacks and hearing recordings from people who were there that day. With a pre-reserved ticket, you won’t have to wait in line, so head straight up to the One World Observatory. Board a Sky Pod elevator to ascend 102 floors in less than 60 seconds, and watch a brief video that dramatically reveals New York City in three dimensions. On the 100th floor, look out panoramic windows from a height of 1,250 feet (365 meters), and step into the Sky Portal, a 14-foot-wide (4-meter) disc in the floor that showcases city streets below in live HD. Then experience City Pulse, an interactive ‘concierge’ that shares stories of the city, its landmarks and neighborhoods via state-of-the-art technology.